Do you know what is strand length? By Dominik Czernia - PhD candidate and Álvaro Díez - PhD candidate. Putting up Christmas decorations early makes us happier! You calculated everything, now what? Ho ho ho! Christmas is just around the corner! Every town becomes more and more colorful, brilliant lights and beautiful ornaments decorate buildings. And finally, huge Christmas trees, probably the most recognizable sign of Christmas, arise on the big squares in the city centers. This is the perfect time to bring Christmas Trees to our homes too! Let's explore together the way to put the ornaments and predict how many you will actually need. Believe or not, but it has been already calculated by the math professor and our team of physicists improved it even more. The calculator on the left guides you step-by-step with real-time computation and with visualization at the same time. If you're still not sure about it, keep reading the article below for some examples and ideas. We've also written about the Christmas tree history - why do we bring them and decorate in our homes? In the end, you will find an answer to the age-old debate of whether ribbons are superior or not to lights as Christmas decorations. And if you're from the U.S. wondering whether there are any chances of snow this year, check out our White Christmas calculator! Christmas is upon us, much closer than you might think, but still further than advertisements want you to believe. The real conclusion if you look at how many days remain until Christmas is that we should start getting ready for it. One of the things you probably want to set up is your Christmas tree. And no Christmas tree is complete without ribbons or lights. Which brings up an important question: How many Christmas tree lights do you need to decorate your tree properly? The term "properly" is a subjective one but assuming you already have a perfect way the tree should look like, how do you know the length of lights you will need to decorate your Christmas tree? We have the solution! In the following sections, we show you how to wrap a Christmas tree most efficiently and aesthetically. How? - you might ask - how to decorate a Christmas tree in the perfect way? It's easy, we will just need maths and a bit of ingenuity. There are many subjective things to take into consideration when deciding how to decorate a Christmas tree. Whether you prefer ribbons or light, what colors to use, how bright (brightness is measured in lumen) you want it to be, how high electricity cost are you willing to assume, and even where you want your tree (indoors or outdoors). However, certain aesthetic factors will please most people such as uniformity, symmetry, proportionality... And those are the kinds of things that we can help you with, in our Christmas tree calculator. Before you we get to know how the Christmas tree calculator works, let's see how can you use it for your purposes. To begin the explanation, let us explain what each of the fields is referring to (take a look at the picture below for more details). Tree coverage: percentage of the surface of the tree that will be covered by baubles. If you want to control more variables, click on the advanced mode button and see what else you can do! The Christmas tree calculator has 3 sections. The first section is dedicated to entering the dimensions of the tree that we want to decorate. The second and third sections are devoted to the actual Christmas decorations themselves with 2 options: lights (or ribbons) and baubles. For both the Christmas tree and the baubles sections, you will need to provide 2 inputs in each section while for the Christmas tree ribbon/lights section you only need to provide one. In the previous section of the text, we have discussed how to decorate a Christmas tree in the most effective and harmonious way, so that is how the calculator assumes you will do it. 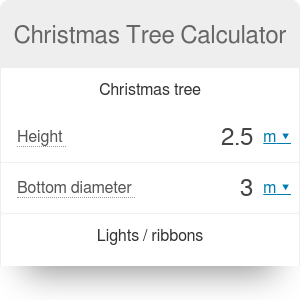 The Christmas tree calculator will show a simulated image of how the tree would look like with either the lights/ribbons or the baubles. The pictures will give you a good idea of how the Christmas tree would look like using the parameters you have input. But Christmas tree decorations, and all that surrounds this symbol of Christmas time, were not as popular in the past as we think. In fact, the Christmas tree history is a fascinating one as we will explain later. 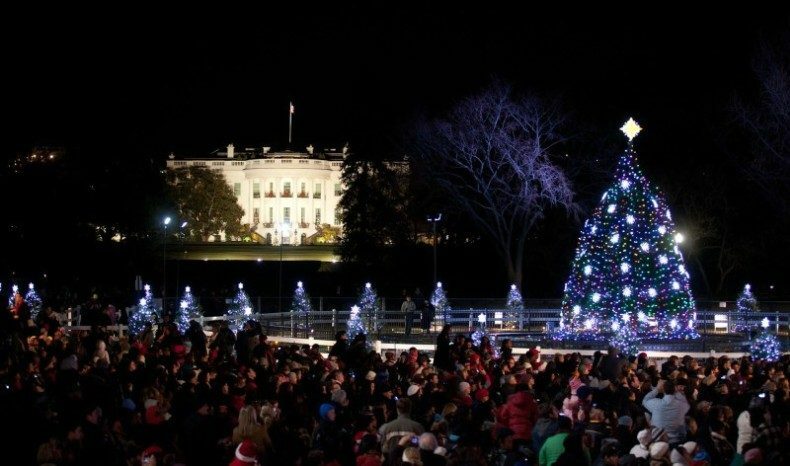 Spoiler alert: the first Christmas tree probably appeared much later than you think. We decorate Christmas trees in almost every house, usually without any previous preparations. Now, let's do it mathematically! To find the perfect Christmas tree decorations, we need to take into account symmetry and uniformity. Using Dr. Troy Henderson's method, we can predict the length of decorations, lights or ribbons that we need to achieve our desired level of "tree coverage". Using maths, we can also calculate the number of Christmas baubles we need for our tree. Let us show you how to do it. At first, you have to decide how do you want to wrap the light or ribbons around the tree. You don't have to think about it very much! We know the answer. The best option is the mathematical shape called Conical Helix. To understand this curve, aside from looking at the picture below, imagine a helix wrapped around a cone so that as it goes up, it gets narrower and narrower. 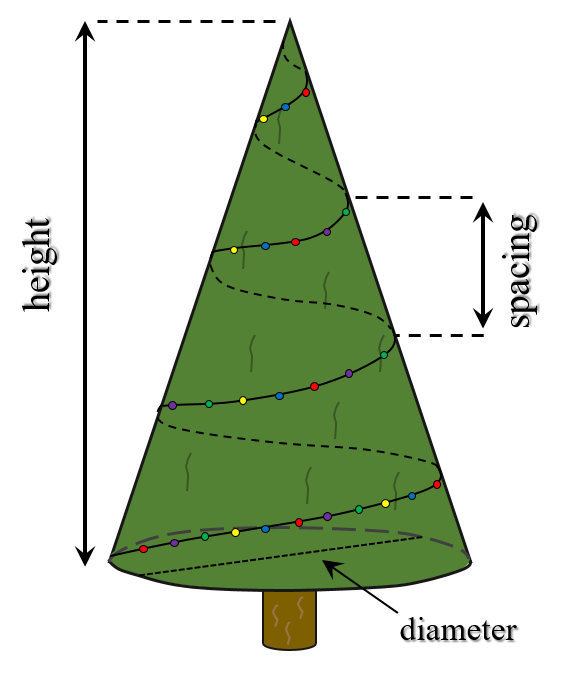 Since we can all agree that a typical Christmas tree looks very similar to a cone, you can see how this shape is an excellent way to put your decorations. length = ₀∫¹√[x(t)² + y(t)² + z(t)²]dt. But we did not limit the calculator to Dr. Troy Henderson's idea to model the tree lights, we also included extra functionality. The calculator can not only determine the length needed to adequately cover the tree, but also the amount of Christmas baubles that you will need to use to decorate the tree. For this second calculation, there are no fancy maths required. The calculator will first compute the surface area of the cone formed by the tree. With this value and your desired density of baubles, the calculator will obtain the necessary number of baubles as well as tell you what percentage of the surface of the tree will be covered by this bubbly Christmas decorations. With this information you can now plan how many baubles do you need to prepare and how long should your lights and ribbons be! And it is not just us making that up; it's been scientifically proven by experts! Christmas decorations and promotions on October or November in shops are already a standard that reminds many people of the commercialization of Christmas. However, it turns out that there is nothing wrong with the early celebration of the upcoming Christmas. In fact, according to scientists, it may even be beneficial for us if we start to hang up the decorations a few weeks before others. And the same thing applies to lights and ornaments on the Christmas trees! Having the spirit of Christmas and the joy of its coming, already in November, may make people more friendly, accessible and sociable. Scientists proved this by taking research on the group of people who were shown different homes. Some had Christmas decorations, others didn't. The houses were of different sizes and represented different socio-economic backgrounds. Participants clearly indicated that decorated houses make their owners seem "friendly and coherent". In a world full of stress and anxiety people like to associate to things that make them happy and Christmas decorations evoke those strong feelings of the childhood. In a culture greatly influenced by Christian traditions, like the western culture is, the thought of a Christmas tree makes some people uncomfortable. A Christmas tree is thought of by some as a pagan symbol that is opposed to their religious beliefs but is it really a pagan symbol? Despite the popular thought that Christmas trees are specifically mentioned in the Bible as a form of heresy, it is very unlikely that Christmas trees existed at that time. Even though evergreen branches were used since longer than recorded history as a decoration, the first real Christmas tree seems to have appeared in 1510 in Riga. It was located in the main square of the Latvian capital as Christmas decoration and burnt after the holidays. The first Christmas tree was not the start of a widespread tradition but something more anecdotal. History points towards Germany as the next important milestone in widespread Christmas tree adoption. Protestant founder Martin Luther used them as Christmas decorations. From there, it seems like adoption started growing, as German settlers in Pennsylvania started using Christmas trees as part of the decoration, and using candles as lights. 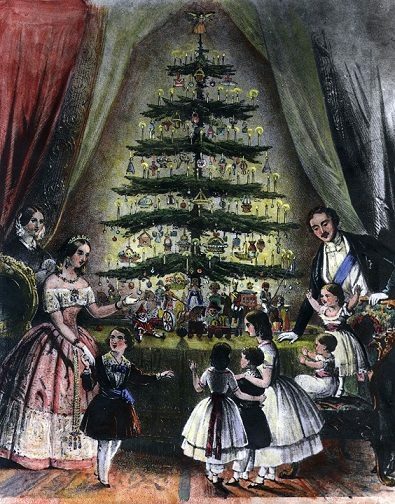 Most of the concerns about pagan symbolism began to disappear as the royal family was drawn celebrating Christmas with a mini Christmas tree as decoration. Since that moment, the usage of Christmas trees and Christmas tree ornaments grew (apparently spreading from east to west) in the USA, until it became one of the key symbols of Christmas. Still today there are concerns about the (pagan) symbolism of a real Christmas tree, but most people embrace this tradition and have their Christmas tree at home. It is tough nowadays to imagine Christmas decorations without thinking of a Christmas tree with all its ornaments. No person should ever be discriminated for their color, shape or looks... and neither should Christmas decorations! Moreover, it is not a calculator's job to pass judgment on what type of Christmas tree decorations are superior. That is why we built this Christmas tree calculator on purpose so that it would be "decoration-type agnostic". Some people prefer to have LED Christmas tree lights because they produce more light and create a holiday-like atmosphere in the room. Others, however, prefer the understated and unobtrusive look of the ribbons. So whether you are in love with lights or you adore ribbons, we have you covered. The calculator will provide you with a result, no matter what type of decoration you want to use. 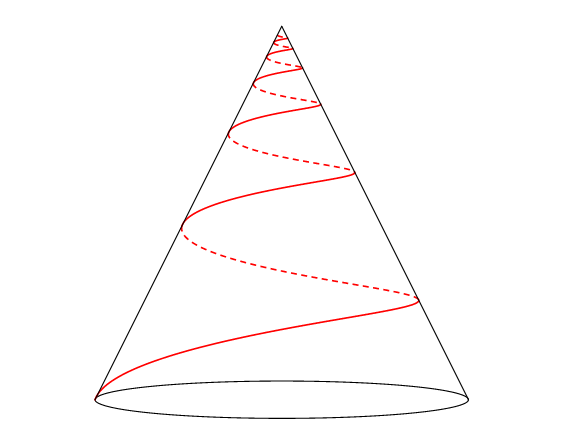 As long as you are wrapping the Christmas lights/ribbons in the conical helix shape we have discussed above, you will be fine, and our calculations will give you useful results. Now that you have figured out how many lights you need, you just need to consider the electricity cost to decide how long you want to keep them on. Alternatively, you can buy better, efficient LED Christmas tree lights and run them for longer and save money. Another option is to build your own set of lights. If you embark in such a DIY project you can probably make use of some of our electrical calculators such as the voltage drop calculator, RC circuit calculator and wire resistance calculator as a starting point. If you also plan to use LED lights, congratulations! You will have lower electrical power consumption with all the benefits associated with it. However LEDs are complex diodes that don't follow Ohm's law. So if you want to understand them truly we recommend checking our ideal diode calculator. Dominik Czernia - PhD candidate and Álvaro Díez - PhD candidate. Christmas Tree Calculator can be embedded on your website to enrich the content you wrote and make it easier for your visitors to understand your message.